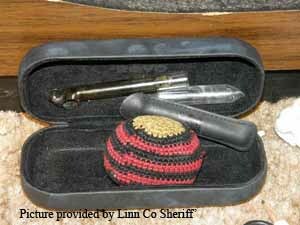 Drug paraphernalia photos to help you identify drug paraphernalia. The picture to the right shows a heroin users kit. A kit for injecting any drug will look similar. 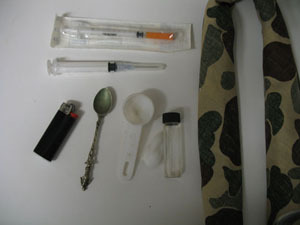 The heroin (not shown) is placed in the spoon, water from the vial is measured and poured over the heroin which is then heated with the lighter. When dissolved it is draw up into a syringe through the cotton, which acts as a filter. The bandana is used as a tourniquet which is tightened around the arm to allow better access to a vein. 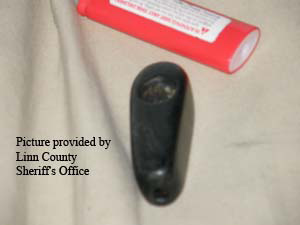 Pictured here is a small pipe used for smoking marijuana. 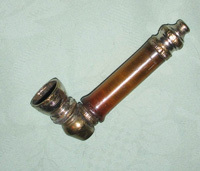 Pipes for smoking marijuana are often metal. They can be quite ornamental and are sold as 'tobacco' pipes. 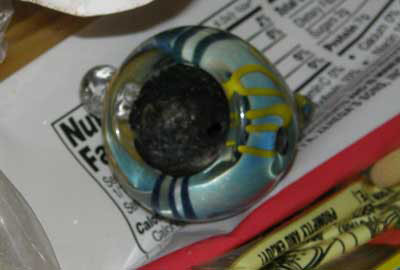 Marijuana can also be smoked in glass pipes pictured below. 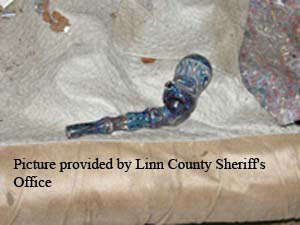 This type of pipe is used for marijuana but can possibly be used for smoking crack cocaine or crystal meth. 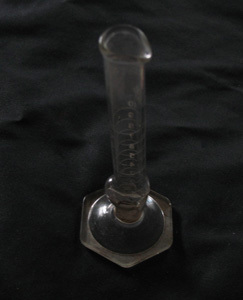 However, these are usually smoked in a glass tube like the one shown below. To the right is a glass pipe which someone has made from laboratory glassware. Note the blown out bulb at the bottom with a vent hole. Likely use would be crack cocaine or crystal meth. 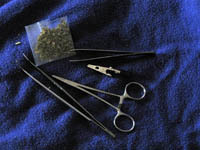 This is an assortment of roach clips used to hold the last bit of marijuana so as to smoke without burning fingers. 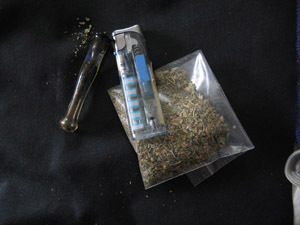 Marijuana can also be smoked using a bong, or waterpipe, where the smoke is drawn up through a small amount of water. 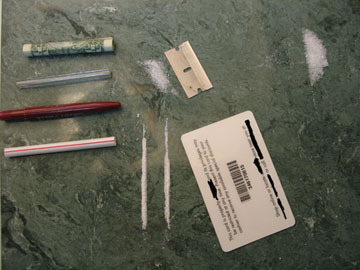 Drugs such as methamphetamine or cocaine are crushed or chopped up with a blade or credit card and arranged into lines on a smooth surface. They are then snorted into a nostril through a straw, rolled banknote. pen case or glass tube. A syringe like this can pose a great hazzard to anyone getting an accidental stick from it. 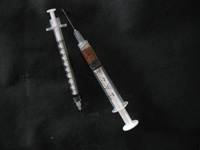 Syringes used by drug abusers are often left with blood in them. On the right another type of glass pipe. This would most likely be for smoking crack or crystal meth. 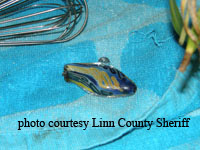 Shown here is a glass pipe in a carry case. 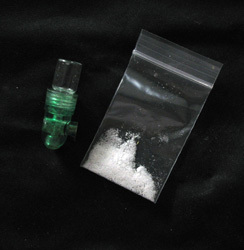 This small gaget is for carrying, grinding and snorting methamphetamine or similar drug. Can be used whilst driving without needing to make a line and use a straw etc. This is just a small sample of the ways that drugs can be introduced into the body. 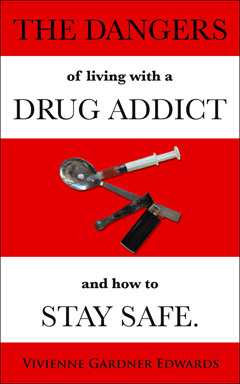 Have you found something that you think is drug paraphernalia but are not sure? You may contact me and give me a description of the item(s) and I will attempt to get an identification for you. This is a free service and completely confidential. Don't have a Kindle? No problem. Download the Kindle Reader onto your computer.